Do you have questions about our Solar-One batteries, or questions about solar in general? Give us a call at 1-800-472-1142. Solar-One flooded batteries feature a design that’s so unique, it’s patented. HuP technology, created by a team of DuPont and EnerSys chemists, virtually eliminates flaking and shedding of positive materials--the main cause of battery failure. And their innovation in casting manufacturing allows production of stronger, thicker positive grids that are less susceptible to corrosion. The Solar-One positive grid is the heaviest in the industry, and allows for the maximum amount of active material in each plate. When you buy Solar-One batteries, you’ll be insured more deep cycles, a longer battery life, and a higher capacity for sustained performance during each cycle. They’re so dependable, they're backed by the longest standard warranty in the Renewable Energy industry—10 years (7 year free replacement + 3 year prorated)! 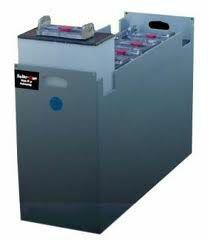 HuP Solar-One batteries are ideal for photovoltaic and alternative energy applications including offgrid homes or businesses, telecom, backup power, or remote outpost. Free shipping is offered to commercial loading docks that have a forklift. If you're a homeowner, you can check with your local hardware store for a place to receive your Solar-One Batteries. For more information, call one of our experienced technicians at (1-800-472-1142). Solar-One features the thickest positive plate in the industry, which means superior performance. Solar-One Batteries have the best warranty in the renewable energy field: 7 years replacement, plus 3 years pro-rated = 10 years. With proper maintenance, expected service life is 10 to 20 years. Compact design in heavy steel cabinet for easy service and small footprint. Solar-One includes tinned copper cell interconnect bars to make a clean and easy installation at no additional cost. No bulky and unsightly cables needed! Individual Solar-One battery cells are removable for easy battery handling. Lifting strap included. Free Shipping* to Continental US destinations with forklift or loading dock. Solar-One flooded batteries feature a design that's so unique, it's patented. HuP technology, created by a team of DuPont and EnerSys chemists, virtually eliminates flaking and shedding of positive materials—the main cause of battery failure. And their innovation in casting manufacturing allows production of stronger, thicker positive grids that are less susceptible to corrosion. The Solar-One positive grid is the heaviest in the industry, and allows for the maximum amount of active material in each plate. When you buy Solar-One batteries, you'll be insured more deep cycles, a longer battery life, and a higher capacity for sustained performance during each cycle. They're so dependable, they're backed by the longest standard warranty in the Renewable Energy industry——10 years (7 year free replacement + 3 year prorated). Free shipping is offered to commercial loading docks that have a forklift. If you're a homeowner, you can check with your local hardware store for a place to receive your Solar-One Batteries. For more information, call one of our experienced technicians.